"Captain Jelly" redirects here. 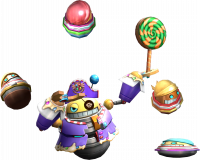 If you were looking for the boss in the DS version, see here. 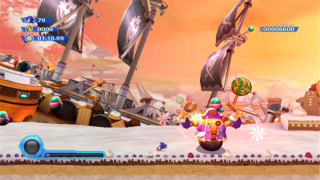 The Sweet Mountain Boss is a pirate named Captain Jelly on a flying ship made out of candy. Attacking this boss requires maneuvering Sonic on the ship to the giant switch at the end. Sonic can grab the Yellow Wisp as you proceed to make the fight easier. Once you hit the switch, the ship will begin to fall, and Sonic and the pirate will land on the ground. You have to then hit him with either the Sonic Boost or by drilling under him with the Drill power. Either way, once hit he will retreat back to his rising ship, and Sonic will follow suit. Repeat this sequence once more and you will have defeated this boss.